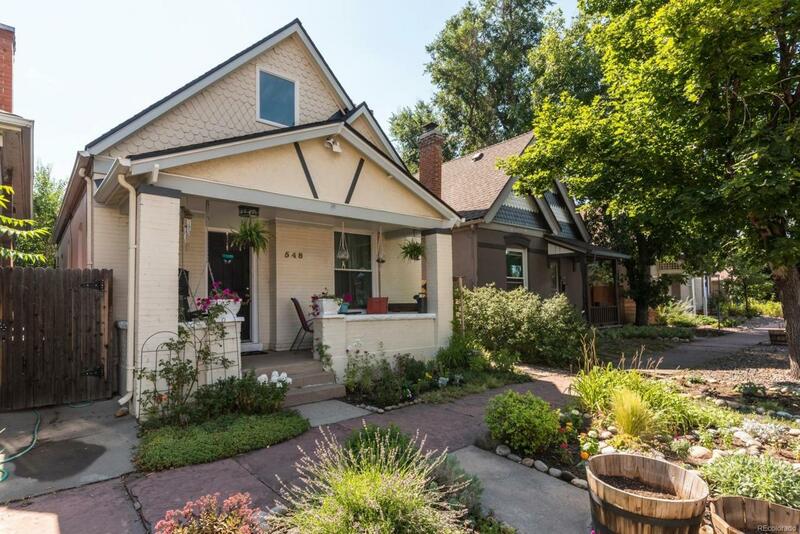 Beautiful bungalow in the historic Baker neighborhood. The entire house has newer paint, newer roof, the kitchen was updated in 2009, new windows, newly remodeled downstairs bathroom and the attic was completely remodeled in 2014, adding a beautiful staircase with a bonus study/bedroom/office and a master suite with an attached bathroom. Both levels have hardwood flooring, tile floors. The master bath has been professionally finished with glass subway tile in the open walk in shower. The upper level, with views of the mountains is bright and open with north and south facing skylights which offers plenty of light enhancing the space. Updated, modern finishes throughout the entire home. Both the backyard & front yard have been planted with perennials and the flagstone patio surrounded by plants is a small urban oasis, perfect for bbq's. The rear courtyard is a tranquil setting perfect for entertaining and relaxing. Just a short walk or ride to the thriving Broadway corridor and downtown.